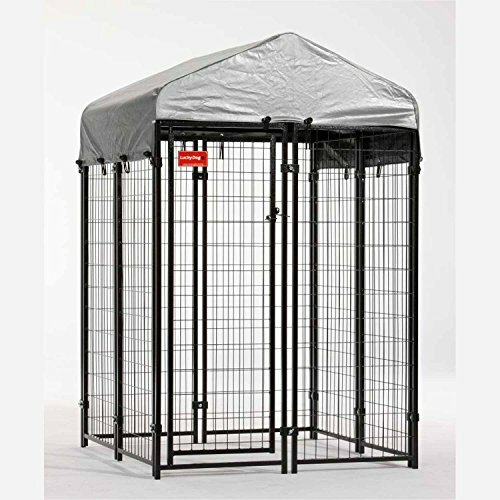 Offer your pet a safe and secure place of its very own with the Lucky Dog 4 x 8 x 6 ft. Uptown Welded Wire Dog Kennel. This single door kennel features a strong 10-gauge welded wire construction with a durable black powder coat finish. A top cover offers weather protection, while a 1-inch leg extension makes it easy to clean. It also includes a lockable steel latch, welded wire mesh panels, square design and a tool-free assembly. Dimensions: 8L x 4W x 6H feet. 10-gauge welded wire with black powder coat. Easy to assemble with no tools required. Includes single door, cover, and lockable latch. Ideal for decks, patios, or yards.